Freelance photographer Preston Mack has developed two applications for the iPhone. After a busy season of baseball playoffs and the World Series, I suddenly found myself with some down time. When a freelance photographer has no work, it is easy to get nervous and paranoid. I find that the older I get, I am better at channeling that energy into something more useful. Normally I hit the golf course or just happily spend time with the family, but recently I decided to use my extra time to finish up a big goal in my life - I was going to develop a video game. I have always wanted to design video games. When I was in high school, one of my first jobs was as a game tester for Infocom (any other geeks out there remember Zork?). In August 2007 I bought an iPhone. This is the third smart phone I've bought in 2 years. I have used the Blackberry 8100 and the Palm Treo 700P. There was always something just annoying enough about both phones that made me want a better device. I knew that the iPhone would fit my needs perfectly. My wife groans every time I decide to buy a tech gadget, but she agreed to the iPhone purchase if I could use it to entertain our son Henry when we were out at restaurants or running errands. I thought initially that I would just show him movies on it, but then I decided I would rather have him interact with a game and learn something. That was my opening. Very quickly, I figured out that Objective C programming wasn't going to be a walk in the park. I had a hard time with interface, headers, objects, methods... AARRGGGHHH! I realized I would need to hire out some of the game development. The first step was using my research skills to find software developers. I found one that was affordable and trustworthy. Next, I turned to my contacts that I knew through photography. I called on art directors and public relations managers that I work with and asked for their recommendations. I was quickly able to find a great character illlustrator, musician, and a graphic artist. My idea was simple - I wanted to create a mix and match game similar to the ones I had created when I was a child. When I was really young, I remember coloring three identically sized characters on a piece of paper. The teacher then cut the sheet of paper into three thin horizontal strips and taped them to a can of soup. I remember playing with these strips of paper, moving them around and making these funny looking characters with mismatched body parts. I wanted to make a digital version of this for my son because I just knew he would find it funny. I outsourced the components I couldn't do but did everything else. The many years of Photoshop experience, of course, proved invaluable. There were long hours of tedious but necessary imaging work to polish the game up. These things I could do on my own time, whenever I had time away from photography assignments. I also quickly learned Garage Band, the Apple iLife music program. I had a great time making the recordings and multi tracking the layers of sound. I think that these details really bring life to the project. In the end, I can say that these 6 weeks have been very rewarding. I was able to utilize the skill set that I had developed as a professional photographer and applied it to something that seems to be completely different from what I do. 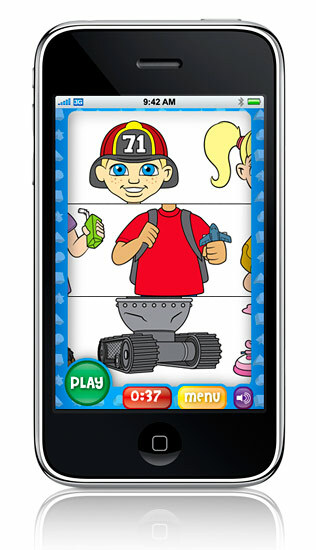 I wanted to make a great iPhone game for kids, and I think I was able to accomplish that. My first iPhone game, Henry & Hailey's Preschool Pals - Kids Mix & Match Game was uploaded to the iTunes store in late November. I hope that all of you reading this article will log into the Apple iTunes store and check it out. My best time is 41 seconds... can you beat it? (It is only .99 cents, so please download it... And while you are at it, please leave a nice review). My second application, Henry & Hailey's Preschool Pals - Kids ABC was just released. 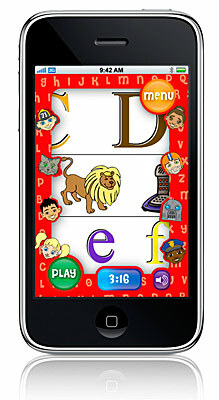 This game is an alphabet learning game for preschoolers. Developing software will never replace my love for photography, or generate the same income. However, I learned that if we can harness our skills and apply it to other fields, we would be surprised at what we can accomplish. I fear that the upcoming year will be very difficult for many of us. It will be important to try to stay positive and productive through this rough patch. Remember, your creativity is not limited to photography. The more you create and innovate will help you in all aspects of your career.